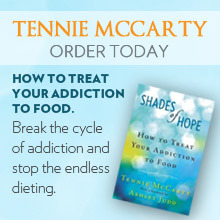 On tonight’s season finale of the A&E hit show “Intervention,” alcoholic and compulsive overeater Terry will get treatment from Tennie at Shades of Hope. Once a stunning model and devoted mother, Terry binges on vodka every day to escape her mother’s taunts and her father’s neglect. She ignores her doctor’s warning that she will be dead in six months if she doesn’t stop drinking. Leon, a 25-year-old Russian-Jewish immigrant and former cello prodigy, smokes PCP to escape from the feelings of disappointment and failure that plague him. Both Terry and Leon have one last chance–an intervention. Learn more about the show and check your local listings at www.aetv.com.